Easy cleaning and maintenance as the materials used are resistant to the chemicals used in composite processing. 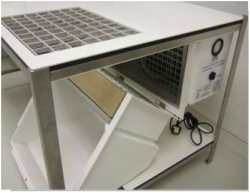 Stainless steel frames, laboratory grade work tops, composite housings and sacrificial polypropylene surfaces make the benches easy to clean so they will look good in years to come. CE marked and compliant with HSG258 ‘Controlling Airborne Contaminants at Work’, and other relevant regulations. 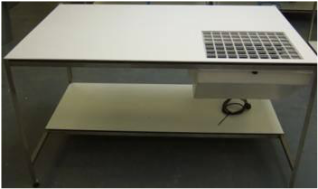 Large work surface with side mounted extraction unit and 465 x 365mm extraction grid, this bench is particularly suited to small companies, laboratories and training facilities. 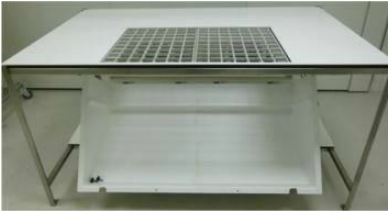 With a higher capacity, centrally mounted extraction unit and 730 x 465mm extraction grid, this bench is particularly suited to larger parts for R&D and repair facilities and small production facilities.